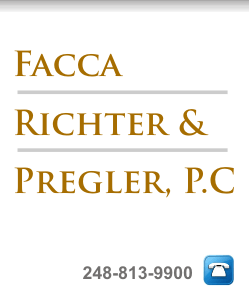 Facca, Richter & Pregler, P.C. The firm represents Owners, General Contractors, Surety Companies, Construction Managers, Design Professionals, Subcontractors and Material Suppliers. The clientele has disputes in Federal Court, State Court, and Alternative Dispute Forums, such as arbitration and mediation. Furthermore, the disputes have involved large construction projects including, Mass Transit, Power Plants, Wastewater Treatment Plants, Automotive Plants, Hospitals, Churches, Educational Facilities, Highways, Airports, Stadiums and Arenas. Our firm has expertise in Design, Engineering, Construction and Surety matters including design professional liability, construction claims, bid protests, contract claims, bond claims and lien actions and construction related injuries. The principals of the firm are active members of Trade Associations, such as the Associated General Contractors, Design Build Institute of America, the Construction Association of Michigan, and the American Arbitration Association. Also the principals maintain memberships in the American Bar Association (Public Contract Law Section), State of Michigan Bar Association (Alternative Dispute Resolution and Real Property Law Sections), and the Oakland County Bar Association. The Firm offers extensive legal experience and practical knowledge of construction useful in resolving disputes through negotiation or litigation. Disclaimer: This is an advertisement. The materials on this web site have been prepared by Facca, Richter & Pregler, P.C. for informational purposes only and should not be considered legal advice. This information is not intended to create, and receipt of it does not constitute, an attorney/client relationship. Internet users and online readers should not act upon this information without seeking professional counsel. We service clients through out the State of Michigan.